Nikon’s P100 is the company’s third-generation SLR-style super zoom, replacing the P90. Launched in February 2010 it swaps its predecessor’s 12.1 Megapixel CCD sensor with a 10.3 Megapixel back-illuminated CMOS sensor. Though moving to a lower resolution sensor might seem like a retrograde step, the P100’s new sensor provides a step up in video performance with 1080p HD shooting as well as some very impressive high speed continuous shooting modes – the P100 can shoot 10fps at its full 10 Megapixel resolution. The new model also increases the zoom to 26x with a 26-678mm equivalent range and increases the resolution of the 3in articulated screen to 460k pixels. This is a tough market and the COOLPIX P100 will have to overcome a lot of preconceptions about the merits of high resolution sensors if it’s to capture market share from cameras boasting a 4 megapixel resolution ‘advantage’. 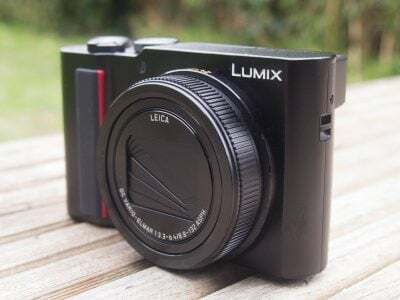 It has some compelling features and manages to fit them into a body that’s a little smaller and lighter than the competition – namely the Panasonic Lumix FZ45 / FZ40 and the Canon PowerShot SX30 IS – with which we’ve compared it. Read our full review to discover if the P100 really does offer more for less, and the whether the trade off of lower resolution for advanced features at a reduced price is one you should consider making. Measuring 114 x 82 x 99mm the P100 is pretty much the exact same size as the model it replaces. Weighing 481g including the battery it’s both lighter and smaller than its rivals the PowerShot SX30 IS and Lumix FZ45 / FZ40. Though the Canon is significantly bigger and heavier, there’s only 17 grams difference between the Lumix FZ45 / FZ40 and the COOLPIX P100. The P100’s rubberised grip makes for a secure and comfortable hold and all the controls are nicely positioned, seeming to fall conveniently under either your right index finger or thumb, where you’d intuitively expect them to be. On the top panel the mode dial has positions for the PASM exposure modes, Auto, a custom User mode, an AF tracking mode, Smart portrait, Scene Auto Selector (scene detection), a SCENE position for selecting scene modes and finally, the Sport continuous burst mode. Aside from the shutter button with its zoom collar the only other button on the top panel is the flush-mounted on/off button. The rear panel has a set of buttons mounted on a bevelled upper ledge. On the left of the EVF there’s a monitor button for switching views between the main screen and the viewfinder and immediately to the right of the viewfinder is the display button which toggles information overlays. Disappointingly, there’s still no live histogram option here. Moving to the right there’s a new dedicated movie recording button with a switch that selects either the currently set movie recording mode or the chosen high speed movie option. On the far right corner of the rear panel is the command dial thumb-wheel which is used to adjust exposure settings in the PASM modes and to control playback. To the right of the screen is a four-way control pad with positions for flash, exposure compensation, macro and self-timer, with an OK button at its centre. Above it is a single playback button and below it single-function menu and delete buttons. The Nikon physical control layout is very simple and uncluttered and something of a contrast to the button-festooned Lumix FZ45 / FZ40. An AV out port and HDMI mini-port can be found under a plastic cover on the left side of the camera and the combined battery and SD card compartment is located beneath a hinged door on the bottom of the camera. The P100’s built-in pop-up flash unit is activated by a button on the left side of the body just below the flash itself. The flash has a maximum range, according to Nikon, of 10 metres at the wide angle focal length, though that’s using the Auto ISO setting. In practice, though, even at the minimum 160 ISO setting, the flash provided bright, even illumination, see the COOLPIX P100 gallery images for an example. In the raised position, the flash mode can be set using the control pad button to one of four modes, auto, auto with red-eye reduction, fill flash, slow sync and rear curtain sync. There’s also an off mode which seems a bit redundant as returning the flash to its closed position effectively does the same thing. The COOLPIX P100 uses an EN-EL5 Lithium-ion rechargeable battery which provides enough power for around 250 shots on a full charge. This is well short of what either the PowerShot SX30 IS, with 370 shots, or the Panasonic Lumix FZ45 / FZ40 with 580 shots, can manage and there are plenty of situations we can think of where it would be advisable to take a fully charged spare with you. One advantage the COOLPIX P100 has over the competition is that the battery is charged while inside the camera and this can be done either with the supplied power adapter or when the camera is attached to a PC with the supplied USB cable. So if you’re taking a laptop on your travels you don’t need to worry about taking a battery charger as well. The P100 has a 26x zoom lens with a range of 4.6-120mm, 26-678mm equivalent. This is a small, but significant step up from its predecessor, adding an extra 54mm equiv at the telephoto end. Alongside the Lumix FZ45 / FZ40 and PowerShot SX30 it occupies the middle ground. The 26mm wide angle is a tad narrower – 1mm – than the FZ45 / FZ40 and 2mm narrower than the SX30 and the 678mm telephoto out guns the Lumix FZ45 / FZ40’s 600mm, but falls well short of the awesome 840mm telephoto range of the PowerShot SX30 IS. Having said that, such comparisons between extremely long zoom ranges are a little academic. The P100’s 26x zoom is going to be more than adequate for most of the people most of the time. At f2.8-5.0 the focal ratio is similar to competitor super-zooms. It’s a little wider than the PowerShot’s f5.7 at the telephoto end, but given the difference in focal length that’s to be expected. The camera is comparitively slow to power up, taking a little over two seconds, during which time the lens extends 18mm from the barrel. The zoom has two speeds the faster of which is very quick, covering the entire range in a little over a second. On our review model though, the zoom in the tele-wide direction frequently would only operate in the slower zoom speeds. The zoom rocker is quite difficult to control and it’s all to easy to slip from slow to fast inadvertently. We were able to nudge the zoom through 26 discrete steps in either direction. The optical zoom can be used in movie mode where it defaults to the slower of the two speeds. 100% crop, 4.6-120mm at 120mm, 1/30, 160 ISO, Manual mode, Vibration reduction off. 100% crop, 4.6-120mm at 120mm, 1/30, 160 ISO, Manual mode, Vibration reduction on. Unlike the Canon PowerShot SX30 IS and Panasonic Lumix FZ45 / FZ40, the Nikon P100 doesn’t have optical image stabilisation, but instead opts for ‘Vibration reduction’, which moves the sensor to counteract camera movement and help eliminate camera shake. The system automatically detects vertical or horizontal panning and disables correction in that plane, so you don’t need to turn it off or, as with PowerShot cameras, select a special panning mode. Vibration reduction doesn’t function in movie modes though, which puts the P100 at a disadvantage compared to the SX30 and FZ45 / FZ40, especially when using the longer end of the zoom. To test the COOLPIX P100’s Vibration reduction image stabiliser we took a sequence of shots with VR both enabled and turned off and compared the results. The crops above are from two shots taken with the COOLPIX P100 with the lens set to its maximum zoom setting of 678mm equivalnet and the shutter speed set to 1/30th of a second in Manual mode. For the image on the left VR was set to off and in the right crop it was set to on. According to the age old rule of thumb, to avoid camera shake at this focal length you’d expect to need a shutter speed of 1/680th of a second or faster. By eliminating camera shake at 1/30th of a second the COOLPIX P100 manages more than four stops of compensation, putting it up there with the optical lens-shift systems of the PowerShot SX30 IS and Lumix FZ45 / FZ40. In addition to Vibration reduction the P100’s electronic VR, when activated, processes images to remove blur. A third anti-blur system, Motion detection, raises the shutter speed and/or ISO sensitivity in Auto and some scene modes to avoid shutter speeds that are likely to result in camera shake. The P100 has four AF modes, Face priority, Auto, Centre and Manual. Face priority is available in the PASM exposure modes as well as Portrait and Night portrait scene modes, but, strangely, it’s not the default AF mode and isn’t even an option for Auto mode shooting. There’s also a Subject tracking AF mode that’s available as a scene mode selected from the mode dial. This works well, but we’d prefer to see it as an AF option for the PASM exposure modes rather than a scene mode. In practice Face priority AF works very well, with the same caveats that apply to other Face detect AF systems, namely, that in low light, when subjects are a long way from the camera and when they turn to partial-profile, face detection becomes much less effective. When the Smart portrait scene mode is selected the P100 can automatically fire the shutter when a smile is detected. Five shots are taken and the one with the most smiling faces is automatically selected. There’s no means of changing the sensitivity of the smile detector, but it’s pretty sensitive, responding rapidly to ‘real’ natural-looking smiles without requiring your subjects to bare their teeth or adopt insane grins. Smart portrait mode also has a Blink proof setting which shoots five images when the shutter is pressed and automatically chooses one in which the subjects eyes are open. Auto AF uses a nine-area system to detect high contrast edges. It’s fast and accurate and functions well even in low light conditions. Centre AF focuses on a small central portion of the screen. Unlike the equivalent AF modes on the PowerShot SX30 IS and Lumix FZ45 / FZ40 you can neither change the size of the central area nor move it around. To do that, you need to switch to ‘Manual’ mode where you can select one of 99 focus regions using the control pad to move the focus rectangle around an 11-column 9-row grid. While the Canon and Panasonic systems with their focusing scales provide something akin to real manual focus control, the P100’s manual option is a fairly poor surrogate. In Full-time AF mode the P100 Autofocus functions continuously, adjusting focus even when the shutter release isn’t half-pressed. Alternatively you can set it to single mode so that it focusses only when the shutter is half-pressed. The AF mode can be separately configured for stills and movie shooting, so you could set single AF for stills to conserve battery life, something well worth considering on the P100, but Full-time AF for movies. The P100’s screen has been upgraded and now packs in twice as many pixels as that of its predecessor. The P90’s 3 inch 230K pixel screen wasn’t one of its strong points and the increase to 460K pixels makes a big difference to the quality. The view is crisp and detailed, though the colours are still cool and under-saturated compared with the lower resolution screens of the PowerShot SX30 IS and Lumix FZ45 / FZ40. This, of course, has no bearing on image quality. Like its predecessor, the COOLPIX P100’s screen is articulated but, unlike the PowerShot SX30 IS, it only rotates on a single axis. This means it can be angled down by 82 degrees, or up by 90 degrees, making it suitable for high or low angled viewing with the camera in landscape orientation. While this is undeniably useful, it’s not as useful as being able to use the screen at any angle including forward-facing and it’s hard to understand why Nikon has opted for this half-way house rather than fit a fully articulated screen to the P100. Like other super-zooms, the P100 has an electronic viewfinder in addition to the main screen. The EVF displays the exact same view as the screen when the Monitor button is pressed to switch between them and pressing the Display button toggles display overlays superimposing camera settings and exposure information, and a nine-area grid. The viewfinder can also be used in playback mode, which can be useful for reviewing images in bright sunlight, but ordinarily playback is better on the main screen. The P100’s menu system is displayed over four tabs with Shooting, Movie, Playback and Set up menus. Unusually, all four tabs are always active – you can access the playback tab while in shooting mode and vice versa. Menu contents are modal though, in Auto mode, for example, the shooting tab is restricted to image quality and size. In the PASM modes the list expands to include White balance, ISO sensitivity, Metering mode, Continuous shooting, AF area mode, and others. The COOLPIX lacks anything like the PowerShot SX30 IS’s Function menu or the Lumix FZ45 / FZ40’s Q.Menu, so there’s no shortcut to commonly used settings like ISO sensitivity AF mode or continuous shooting options. That’s a definite drawback but, like its physical controls, the COOLPIX P100’s menus benefit from simplicity so most things can be found reasonably quickly. Nikon has imitated Canon’s hints and tips feature, a flick of the zoom collar activates a help screen explaining the currently selected menu option. The Movie tab is always accessible because the P100 has no movie mode on the dial – when you press the dedicated movie record button the P100 starts recording in whatever mode you set here – either normally or at high speed, depending on the position of the switch. Single or Full-time AF is selected here as is electronic VR (blur reduction achieved through image processing and not to be confused with sensor shift Vibration reduction which sadly isn’t available for movie recording) and wind noise reduction. The P100’s stereo mics are quite sensitive to wind noise so this last one is likely to prove useful. The Playback menu includes some basic editing tools, printing options, and slide show replay. You can also post-apply Nikon’s D-lighting dynamic range tonal enhancement and rotate images – the P100 doesn’t have an orientation sensor like the PowerShot SX30 IS and Lumix FZ45 / FZ40. Finally, the Set up menu contains the camera settings that you’re only likely to change rarely like the date and time, monitor settings, Motion detection, digital zoom, sound settings and card formatting. The P100 provides the full range of program auto and semi-auto PASM modes in addition to Auto mode, a range of scene modes and Scene auto selector mode – a scene detection auto exposure mode. Having identified the scene type, Scene auto selector chooses one of six scene modes – Portrait, Landscape, Night portrait, Night landscape, close-up or Backlight and displays the appropriate icon on the screen or viewfinder. If it can’t place the scene in one of the above categories it defaults to Auto mode. In use, Scene auto selector worked well most of the time but was prone to occasional mis-identifications. Most often it would identify ordinary daylight scenes as backlight or night-portrait, occasionally selecting Close-up mode even though there was nothing within several metres of the lens. But these were occasional blips, rather than the norm. In Program mode the Command dial can be used to select an alternative aperture/shutter speed combination and in semi auto and manual exposure modes it’s used to change either the aperture or shutter speed. Visual feedback on the exposure situation is fairly scant in manual mode. There’s a digital readout of the aperture and shutter speed settings, and a scale which indicates under- and over-exposure when the Command dial is rotated. But it disappears when you half-press the shutter release and you have to jog the command dial to get it back. Other than the scale, there’s nothing to tell you if the exposure is incorrect, the readouts don’t change colour or flash and the screen brightness remains fixed. In Aperture and Shutter priority modes if you select a setting which means the camera can’t make a correct exposure, for example if you set a shutter speed that’s too fast to guarantee adequate exposure even at the maximum aperture, it at least flashes when you half press the shutter release. The P100 has a good range of scene modes, but compared with the PowerShot SX30 IS and especially the Lumix FZ45 / FZ40 with it’s plethora of dial-up scene modes, they’re difficult to get to. You first have to select the scene mode position on the mode dial, then press the Menu button, then select the Scene menu tab before choosing the one you want from the list. That list includes the ones we mentioned earlier in Scene auto selector mode plus Party/indoor, Beach/snow, Sunset, Dusk/dawn, Food, Museum, Fireworks show, copy, Backlit scene HDR and Panorama assist. The P100 can shoot video in 1080p HD resolution at 30 frames per second. HD video is encoded in AVC (or, to give it its other name H.264) format and stored in a QuickTime wrapper file with a .mov extension. There are two 1080p HD options available, the best quality one has an average bitrate of 14Mbps and there’s a second quality option that encodes at an average 12Mbps. There’s also a 720p HD recording mode which has an average bitrate of 9Mbps. Two non-HD modes are also available, VGA at 640 x 480 pixels and QVGA 320 x 240 pixels. At the best quality 1080p HD setting you’ll fit around 35 minutes of footage on a 4GB memory card, and Nikon recommends you use a Class 6 card. The P100’s maximum recording time in any movie mode is limited to 29 minutes. The P100 has a variety of high speed (slow motion) movie options. The fastest shoots QVGA resolution clips at 240fps. When played back at 30fps this slows the action down to one eighth real time. There are also 120, 60 and 15fps modes with replayed action at a quarter, half and 2x real time with resolutions of VGA, 1280×720 and 1920×1080 respectively. The maximum recording times for these high speed movie modes is restricted to 10 seconds for the 240 and 120fps modes, 30 seconds for 60fps and a minute for 15fps. The P100’s 1080p HD video quality is excellent. However, the stereo mics are very sensitive and managed to pick up the noise of the zoom motor even though it’s very quiet. On the plus side they work well for recording speaking subjects several metres from the camera. Our review model also had a slightly creaky zoom rocker, which was also picked up on the audio, as was wind noise, even though it wasn’t particularly windy. Another downside is that the Vibration reduction isn’t functional during movie shooting, making handheld footage shot at high zoom settings very shaky. This hand held shot shows the full extent of the COOLPIX P100’s zoom. The AF is prone to wandering during zoom and remains out of focus at the end of the range where, in the absence of stabilisation, things look very wobbly. In this tripod-mounted panning shot, the COOLPIX P100 also loses track of the focus during zooming and fails to correct it, resulting in a full-zoom shot that’s badly out of focus. And in this indoor low light example, the COOLPIX P100 copes well with changes in the light level, but the auto white balance wanders quite a bit. The P100 has some very interesting-looking high speed continuous shooting options. We tested the P100’s continuous shooting capabilities with a Lexar Professional 133x 8GB SDHC card. Let’s start with continuous shooting mode which can be selected in any of the PASM exposure modes. The two main options here are H and L, both of which provide full- resolution 3648 x 2736 shots. In H mode the camera shoots a burst of 6 images at 10fps, we timed it and the 6-frame burst took exactly 0.6 seconds. In Continuous L mode the frame rate drops to 2.8fps but you can shoot up to 200 continuous images. In practice the P100 shot a sequence of 37 images in 14.5 seconds – 2.55fps – before pausing for nearly 4 seconds, then continuing to shoot at a much slower and sporadic rate. For both these continuous shooting settings image quality was set to normal. The P100 also includes the Best Shot Selector (BSS), and Multi-Shot 16 continuous modes available on many COOLPIX compacts as well as an interval timer that can be set to 30 second, 1 minute, 5 minute and 10 minute intervals. The COOLPIX P100 offers much faster burst shooting rates at reduced image sizes in Sport continuous mode. The maximum size for images in this mode is 1600 x 1200 pixels. In Sport continuous mode the Auto option adjusts the frame rate automatically depending on the subject brightness up a to a maximum of 60fps and shoots a burst of 25 frames. Alternatively you can select 60fps which also shoots a 25 frame burst or 120fps which shoots a burst of 60 1280 x 960 pixel frames. Image quality can also be set independently of other shooting modes. Finally, there’s Pre-shooting cache option which shoots a 25-frame burst of 1600 x 1200 pixel images at 15fps with 5 images continually cached and added to the beginning of the sequence when the shutter release is pressed. In practice we found shooting in Sport continuous mode to be quite tricky, mainly due to the fact that the screen initially goes blank, then freezes on the first frame of the sequence which effectively means that once you’ve pressed the shutter you’re shooting blind. This severely reduces your chances of correctly framing the subject, especially if it’s moving and you’re shooting at long focal lengths. It’s not impossible though, as this ten image sequence of a surfer, taken in Sport continuous 60fps mode shows. The COOLPIX P100 has a 10.3 Megapixel back-illuminated CMOS sensor that shots pictures with a maximum size of 3648 x 2736 pixels. Images are saved as JPEG files using one of three compression settings, Fine, Normal, and Basic. Maximum images recorded using the fine compression setting occupy around 4MB. The sensitivity range is 160 to 3200 ISO and the shutter speed range in ASM modes is 1/2000 to 8 seconds extending to 1/8000 of a second in the Sport continuous scene mode. The P100 includes around 43MB of internal memory so you’ll obviously want to equip it with an SD card as soon as possible. To see how the quality of the COOLPIX P100 measures-up in practice, take a look at our real-life resolution and high ISO noise results pages, browse the sample images gallery, or skip to the chase and head straight for our verdict.